My new kitchen is finally in working order (and I choose the words working order as opposed to finished because its still not actually finished… trials and tribulations of which I wont go into) but on top of the chaos the building work has caused in our little house, I’ve had an exam to write (at 4pm on a Friday afternoon after a 3 day intensive course which frankly is just cruel) and roof disasters to deal with (‘disaster’ may be exaggerating slightly but its been a bad week). The net result of all this is that I havent had any time to sit down and work on my blog so this one is a bumper summary of the week’s cooking adventures with a couple of recipes I wanted to share. Last sunday I was in the mood to bake. 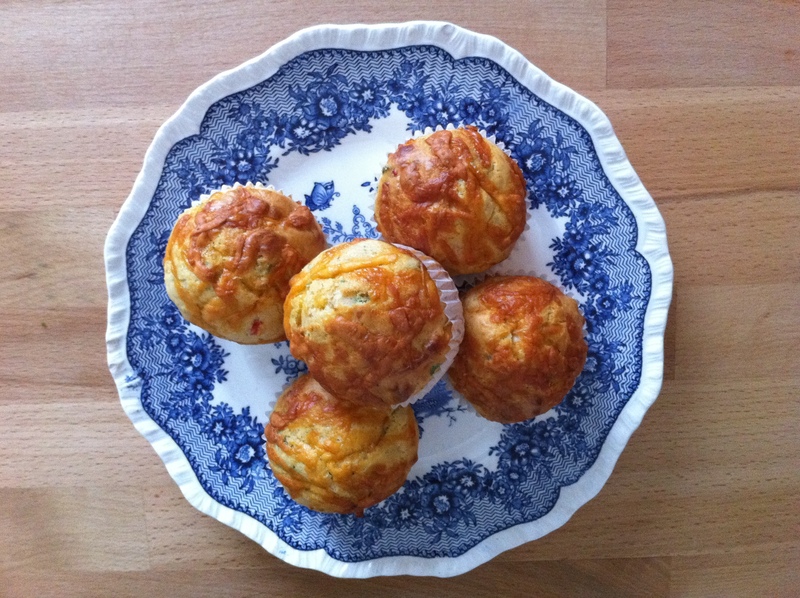 I’ve been thinking about cheese muffins for a while because I used to have them all the time in South Africa but the Scots dont seem to have discovered the joy that is the savoury muffin. There are 3 versions from my past that particularly stick in my head – the ones at our school tuck shop which I used to eat every week for 5 years of my life; the little ones that my friend’s mom used to make for parties at her house and were particularly addictive (thanks Mrs Shepherd!) and the ones at Mugg & Bean coffee shop which always had stomach-grumble-inducing flavour combinations and were large enough to double as a lethal weapon if flung at someone’s head. So, to satisfy my nostalgia and my Sunday food cravings I decided to make my own and thankfully the results turned out to be worth writing about. I mixed some chilli in with the cheese in this batch for a bit of kick but they can be made without or with any other spices or ingredients that compliment the cheese. They are great on their own with a cup of tea or as a side with a bowl of soup and my favourite way to eat them is just cut in half , toasted and lathered in butter. Hopefully they will remind some of you of home. And hopefully they will introduce some of the rest of you to the tummy comforting effects of the cheese muffin. Having made the muffins, there was still a biscuit shaped hole in my Sunday afternoon. I’ve never actually made biscuits and I wanted to try something new so I made these sugar biscuits from another blog I’ve discovered on my wanderings. I was going to make them into sandwiches with different fillings but they turned out to be really big (they spread quite a lot when they’re baking) so you wouldn’t ever get one in your mouth if they were stuck together. They were good on their own but not very exciting so I dipped the bottom of each biscuit in dark chocolate. The result is a chewy vanilla biscuit enveloped in a lovely velvety little chocolate sock, especially velvety when dunked in a cup of hot tea or coffee! Another highlight of my week was dinner on Wednesday night. We were back at Howies in the west end for a celebration with family and it was every bit as good as the first visit. I tried the duck liver pate with onion chutney this time as well as my favourites from before and it was delicious, very creamy and full of flavour. The rest of the week is a bit of a blur and not as productive due to previously mentioned evil exam. I did make a new batch of pizza dough before things descended into chaos – I use a recipe from Falling Cloudberries by Tessa Kiros and it never fails (further praise for Tessa, her pizza dough recipe and my homemade tomato puree recipe to follow soon!). I have to end this post by telling you about the pudding I had last night. It was so rich it just about put us all to sleep but it was so worth the soporific effects for the heavenly experience of eating it and all the week’s stresses melted away in one mouthful. We were visiting friends and my friend Dawn, who is as mad about baking as I am, introduced me to these little chocolate sponge puddings by Nigella Lawson. These babies are seriously good, you HAVE to try them. Just don’t eat them before driving or operating heavy machinery. Preheat the oven to 200 degrees centigrade and grease a muffin tin. If you use muffin papers it’s still worth greasing them as the muffins tend to stick to the paper if you try and eat them when they’re still hot. Otherwise leave them to cool completely and they shouldn’t stick but who has that much self control? Sift the flour twice, holding the sieve as high as you can to air the flour as much as possible. Then add the baking powder, salt, sugar and paprika and mix gently. Add the grated cheese and chillies or any other ingredients you’ve chosen. In a separate bowl mix together the egg and milk and then fold into the flour mixture, being careful not to over mix. Pour the batter into the muffin tray so each one is 3/4 full and sprinkle with grated cheese. Place in the oven for 12 minutes or until the muffins bounce back when you touch them. Let them cool slightly on a rack before serving. They keep for about 2 days in an air tight container if you have enough restraint to make them last that long. Adapted from Eat, Live, Run. Makes about three dozen large biscuits but I recommend making them smaller which would also produce more. Preheat the oven to 190 degrees. Combine the sugars together and then add the vegetable oil, vanilla extract, salt, eggs and bicarb. Whisk well to combine. Add the flour and stir. The dough will be semi-dry. Roll out little balls of dough on a lined baking sheet. Press each dough ball with a fork to flatten and sprinkle with sugar. Bake for eight minutes. Transfer the biscuits to a rack to cool completely. Melt the chocolate in a bowl over a pot of simmering water. Dip the bottom of each biscuit into the chocolate and smooth with a spatula. Leave on a tray to set and then store in an airtight container.